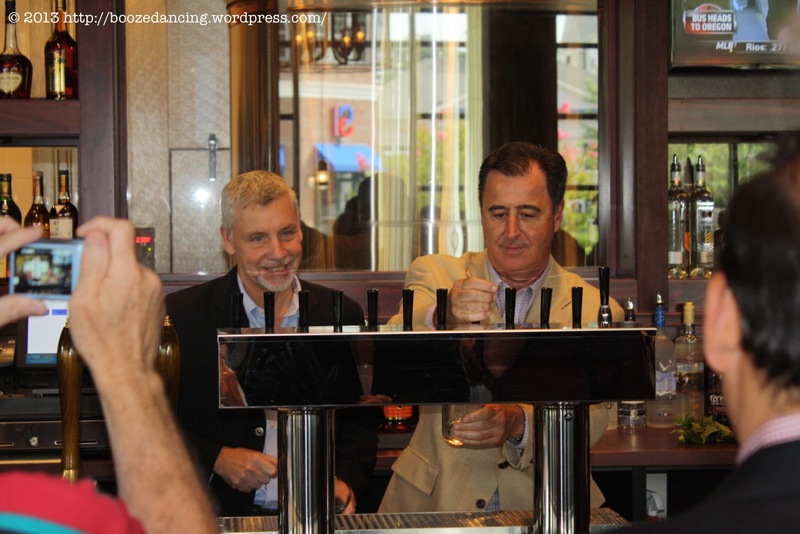 Kevin Finn, CEO & President, Iron Hill Brewery & Restaurant and Michael R. Mignogna, Mayor of Voorhees, NJ at the handles. Iron Hill Brewery & Restaurant is the brainchild of Kevin Finn, Mark Edelson and Kevin Davies, and what began as a single location in 1996, has blossomed into the 7th largest brewpub chain in the country with 10 locations serving PA, NJ, and DE. The idea seems rather simple; offer the customer quality craft beer and complementary food; all of which is prepared on site. As a NJ resident, I have been to their other location in Maple Shade several times and have tried about a half dozen more times to get in, only to find that the wait was too long (with three children in tow) as the location was almost too popular. Now, with a location opening right in my backyard, I was looking forward to the first pour and an opportunity to talk with the folks behind Iron Hill. After the first pour (I selected a Pig Iron Porter), I had an opportunity to talk to Kevin Finn and discuss the measure of success. He admitted that he got into the business for the beer but noted that he has stayed for the people. He is especially proud of how Iron Hill has offered the opportunity for folks who may have entered as part-time wait staff to assume full-time executive positions. He pointed to the Head Brewer, Kevin Walter who started as an underemployed English major moonlighting as a server who five years later is now the resident brewer for the Voorhees store. Kevin Walter then led me on a tour of the brewery which has been engineered to maximize the limited space. Kevin explained the brewing process and his start as a home brewer and then went on to explain the custom design of many of the brewery’s components from the fermentation ranks to the hopback wash to the chillers. Since this is a full production facility housed in the back of a restaurant, space is at a premium. As such, the Iron Hill folks try to think of everything. And, a view into the cooler. Note the tanks are horizontal to maximize space. As if the first pour and tour were not enough, Iron Hill invited some of the press (somehow I qualify as press) to test the dining room. As I was flying solo, I was invited to join Kevin Trayner of Ale Street News along with his wife. That led to a few more beers as I sampled the Mahalo, Apollo! (a summer wheat beer) and the Beebop Brown (an English-style brown ale). For my dinner entree, I opted for the Jaegerschnitzel (pan-fried pork cutlets, buttered egg noodles (what, no spaetzle! ), haricots verts and roasted mushroom sauce). With a heartier meal, I needed a big beer to complement it. So, I selected the Titus 2XIPA, an American IPA (with a powerful 7.8% ABV). Kevin selected the Jaegerschnitzel as well while his wife was looking for something a little lighter and opted for the hummus and the nachos. For an opening night, the service was very good and the food and beverages arrived in no time. After some good conversation and a good dinner, I was looking to spend a little money in return for the night out and asked our server for two growlers: the Rocksteady Pils and the Titus 2XIPA. Well, you can imagine my surprise when the waiter returned and informed me that the growlers were gratis. What an embarrassment of riches and let’s just say, he may have gotten one of the best tips of his life. The mural along the back wall. The muralist also provides the art for the bottles. The Titus 2XIPA, what a parting gift! Many thanks to Jennie Hatton of Profile PR for the media pass and Kevin Finn and the rest of the folks at Iron Hill Brewery for their warm hospitality! Congratulations on the opening and much success! Booze News: Jewish Whisky Company’s 2013 Whisky Jewbilee Details + A Discount Code! Good thing the folks at the Naval Combat Systems facility adjacent to 295 in Moorestown didn’t flip the switch on that weapons grade elecrto magneto ray gun because it would have uprooted anything with a high iron content and a whole hill made of the stuff would have been a pretty attractive target. As it happens, the Maple Shade location was the original site for what was then known as the Sunday Night Beer & Business Gatherings between me, G-LO and my neighbors. That weekly research session morphed into the H.O.P.P.E.R.S. and the rest, as some in the Yahoo Serious Dwarf Tribute Club would say, is entirely without context. It’ll be interesting to see if the Voorhees location does as well as Maple Shade. The local demographics aren’t quite the same and other higher end concepts haven’t flourished there. The Echelon Mall and environs lost its luster sometime in the early 80s. I’ll look forward to a couple research trips and root for their success. Nearly concise and mostly on point. And, when you ventured off topic, you noted that there was no context. For you, a very good comment. I have had trouble getting in to the Maple Shade location, so I look forward to heading over to Voorhees. I’m not sure if the Echelon Mall ever had luster, but the folks at PREIT are doing everything they can to develop a town center and repurpose something of a retail wasteland. Although I missed the First Pour, Mrs. G-LO and I popped in for a light dinner and a couple of beers this past Thursday night. They appear to be off to a great start! The place was packed, but thankfully, we were able to secure a high top next to the bar in jig time. We didn’t dig too deep into the food and beer offerings, but what we had was definitely enjoyable. Mrs. G-LO had the Mahalo Apollo and I had their Saison (the Mahalo was the better beer of the two). Overall, it was a good first experience. Service was very good (courteous and well informed), and the mood was definitely cheery. My only concern are the prices which are kind of on the high side. As The Alemonger said, we should plan an outing soon to see how they’re progressing. I wish them luck! Yes, we must plan an outing (for research purposes only, of course). I am also intrigued with their 2 pizzas and a growler carryout special for $25. A growler is around $20 so you get two pizzas for the cost of a big bag of chips. Haven’t had the pizza yet but this certainly seems like a good way to step up our night. I might have to look into this for our Fall evenings by the fire.